Don't you wish you could get more done in less time? Have you ever said, "There just aren't enough hours in the day?" Are you so busy that you can't find 90 minutes to learn how to manage your time better? 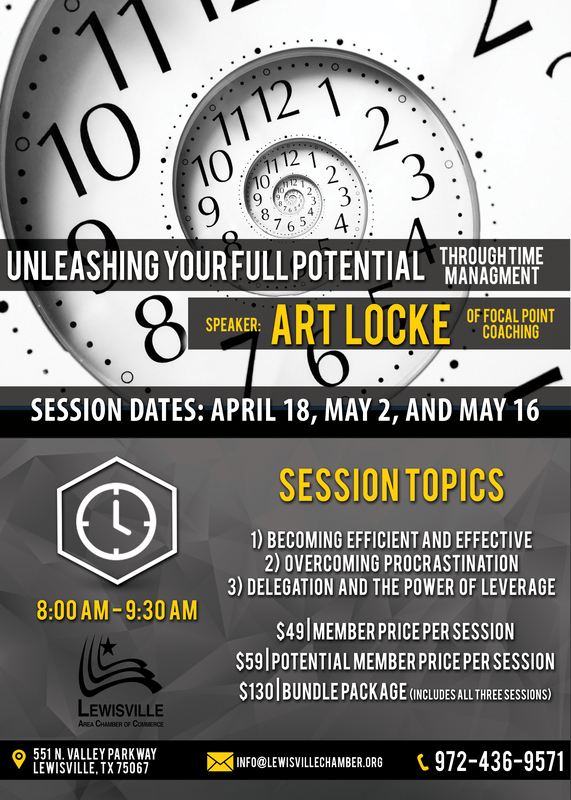 Then Unleashing Your Full Potential Through Time Management Workshop is just the ticket for you! Over the course of three interactive workshops you will learn more than 25 tools and techniques to help you get more out of your time, whether in business or at home. Taught by business performance coach Art Locke. Visit our website for more information or contact Rachel Bagley. Please join us for Member Orientation on Monday April 3rd at 8:00 AM - 9:00 AM. A complimentary breakfast will be sponsored by Jason's Deli on Hebron Parkway. Will the Gig Economy Make the Office Obsolete? The gig economy, where independent consultants, contractors, and freelancers create portfolios of work in lieu of one full-time job, is transforming the way we work by disconnecting work from an office. In the traditional jobs economy, employers often require employee attendance in the office five days a week, eight hours a day. Gig economy employers, in contrast, focus entirely on performance, not attendance in the office. One morning last year, James Dahlman came to Bob Langer's office at MIT's Koch Institute for Integrative Cancer Research to say good-bye. He was meeting with Langer and Dan Anderson-his doctoral advisers. The 29-year-old was about to take up his first faculty position, in the biomedical engineering department at Georgia Tech, and he wanted their advice. I am sharing a huge thanks to our volunteers that covered the Lewisville Area Chamber office this past Wednesday so that all staff could attend a regional Texas Chamber of Commerce Executives training in Grand Prairie. The best follow up email of that day goes to Yvonda Coleman of US Energy Experts, LLC. "Dr. Drew Randall, DDS, stopped by with treats for you but you missed out!! Donuts and ice packs!... you can still use the ice packs)." We are blessed to have so many great servant leaders among us. Thank you for your service to Yvonda Coleman, US Energy Experts, LLC, David Honnell of AFLAC and Will Powers of Concept Keys, Inc.